Some dog owners feel they shouldn’t have to reward their dog for doing certain expected behaviors. They tell me they’re already paying for their dog’s vet bills, food and housing – that should be enough to get their dog’s loyalty. Let me provide some points to consider when it comes to rewarding your dog when training new behaviors or maintaining others. Does the dog really know what is expected of him or her? Human beings have the bad habit of thinking that dogs understand everything we expect of them just because they live with us. Dogs have to be taught what we expect of them and, please remember, they don’t know English! One of the best and fastest ways to teach them is by using food rewards. Human beings are able to recognize that a paycheck is from their employer and is for work they did days or even weeks earlier. Dogs do not have the ability to connect the behaviors we expect of them with the good deeds we do for them (e.g., vet care, feeding, housing, etc.). They don’t understand our human economy at all. Further, dogs are only able to connect reinforcement (e.g., food rewards) to a behavior only if it is offered immediately after the behavior – no more than 2–3 seconds. Would you go to work for free? We all get paid to go to work and perform our job duties. Would you work one more hour if you stopped getting paid? The amazing thing is that dogs will continue to do behaviors even if they are only randomly and occasionally reinforced with treats. However, humans need to be constantly and continually reinforced with pay for our entire working careers! In this regard, we expect more of our dogs than we do of ourselves. Would you continue to do nice things for people if those actions never brought you any kind of positive returns? Even outside of work, humans expect to be “paid” with some kind of return on their efforts. Even though your volunteer work at the animal shelter doesn’t provide any monetary compensation, the interaction with the people and animals is very rewarding and keeps you coming back week after week. All animal species, including humans, need some kind of reinforcement to continue a behavior for an extended period of time. Food treats are not the only kind of reward. 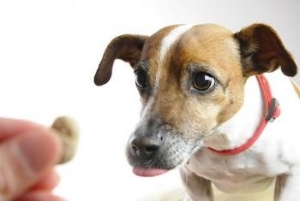 You might be surprised to learn that some dogs don’t even really enjoy treats. They would much rather be rewarded with a game of tug or petting, for example. It’s not necessarily about the food; it’s about the reward. With that being said, most dogs prefer food rewards. Sometimes we think dogs are furry four-legged humans – they aren’t. We’re all guilty of this at times because we get so close to our little buddies. We have to remember that dogs don’t know English and are 100% animals no matter how much we sometimes think they aren’t. I always like to tell clients that you can’t go against Mother Nature; dogs will be dogs. Positive reinforcement provides more durable results in training and doesn’t destroy the relationship with the owner. Sure, you can get a dog to “obey” you by using harsh techniques such as prong collars, shock collars, hitting, etc. (i.e., punishment). The problem with that approach is the training results don’t tend to be as durable and the dog’s relationship with the owner can deteriorate significantly. I’ve had many dogs referred to me that have been trained this way that are scared of their own shadow. Who wants a dog that is a fearful robot? Don’t be afraid to use food rewards when training and maintaining behaviors in your dog. All of the latest scientific research in animal training indicates this approach has the best results. Once your dog is trained to a level that you are happy with, the food rewards can be decreased although you don’t want to completely eliminate them. For more insight on reward and punishment in dog training, please see, Don’t do to Your Dog What Some People do to Their Children.